In any diet, the most important thing is to lose weight. This weight mostly comes in fat, so you need to eat something that helps you burn it fast. Even though it is necessary to control your calorie intake, you should get rid of these excessive pounds first. 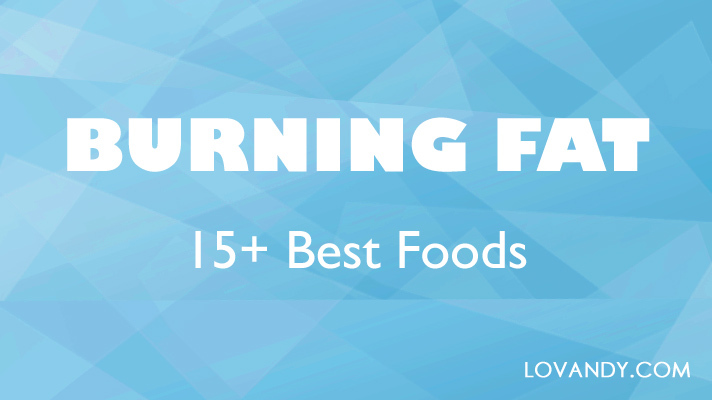 Let us consider top 10 best fat burning products. Fat Burning Foods for Men vs. Women: is there a Difference? If you want to lose weight, it is important to eat only healthy and natural food. You do not need any supplements or pills, when there are so many beneficial products out there. In the list below, we have gathered foods that can help you burn fat naturally, increasing metabolism or decreasing calorie intake. Drinking enough water is important, even if you are not on a diet. It cleanses your body from salts and toxins. Moreover, two glasses of water can increase metabolism by 30%. This means you will burn fat a lot faster. The feeling of thirst is often confused with hunger, so you should drink enough water always. All dairy products (excluding milk) help your body produce more calcitriol – a hormone that makes your cells burn fat. Low-fat dairy, such as yogurt, kefir or cottage cheese can help you lose weight fast and decrease the amount of newly assimilated fats. Moreover, all these foods increase metabolism, which promotes the consumption of subcutaneous fat, so that your body gets enough energy. Ginger is one of the best products to increase the metabolism. It even makes you feel hot, so your fat is burning really fast. In addition, ginger provides excellent secretion and blood supply to the stomach, so all the new fats that come with food are digested rapidly. You can add this spice to your food or drink a ginger tea; both are nice for fat burning. Cinnamon is also a nice fat-burner, so as ginger is. It does increase your metabolism, while also decreasing sugar concentration in blood. Therefore, the accumulation of fats is slowed down. It is a good idea to add some cinnamon to your coffee or tea, especially if you like it with sugar. This way you will make sure no carbs are turned into fat. Grapefruit is famous as a nice fruit for weight loss. First of all, it contains a lot of vitamin C, which decreases insulin level, therefore providing fat burning. Secondly, due to a high content of naringin flavonoid, it promotes the cleavage of fats that come to your body with food. You should eat these bitter membranes of grapefruit too, as there is the highest concentration of a flavonoid. Green tea helps your body increase its metabolism by 20-25% due to a high caffeine concentration. However, it is not harmful for your heart, as coffee is. Moreover, green tea makes your cells burn both subcutaneous and visceral (internal) fat. Therefore, it helps you lose weight even faster. These small berries contain many fruit enzymes that provide the cleavage of fats. By eating raspberries after dinner, you help your stomach work faster and easier. It also increases metabolism. What is more, raspberry is a negative-calorie food, so you will not gain weight by eating any. Any beans (peas, lentils, chickpeas) contain huge amounts of vegetable protein. This substance is beneficial for your health; but what is more important, your body needs a lot of energy to absorb it. All the calories contained in beans are not enough, so fat is burnt to get more. Therefore, it is a good idea to eat any beans as a garnish. Red wine contains an active ingredient – resveratrol, which stimulates the production of a protein that blocks receptors in fat cells. Resveratrol promotes splitting of fats and slows down the formation of new fat deposits. This ingredient is a part of grape peel and white wine; however, in these products it quickly oxidizes and becomes less effective. Only red wine contains resveratrol in big amounts. However, you should not drink too much, as any alcohol may lead to weight gain. One glass in the evening is enough. Regular consumption of fish lead to the decrease of leptin in your body. This hormone makes your cells accumulate fat, so the lower its level is, the faster fat burns. Salmon is the most beneficial fish, as it contains the highest amount of omega-3 fatty acids. These substances help your body lose weight faster by burning cholesterol. Perhaps, belly fat is the most disturbing one. That is why there are many advertised supplements that ‘magically’ make it disappear. The truth is these things do not work as desired. The best way to get rid of belly fat is to eat a healthy low-calorie food. We have indicated in the list below products that make your body burn subcutaneous fat. This type of fat is the one affecting your belly the most. However, it does not mean any of these will work instantly. You should eat healthy food only and do some exercises to make the fat go away ASAP. Boiled chicken or turkey meat is a nice source of protein. That is why sportsmen eat these a lot. However, even if you do no exercises, your body needs many calories to digest these proteins. If you have not eaten anything else, the energy will be taken by burning subcutaneous fat. The biggest amount of it is situated on belly. We have mentioned before that green tea is one of the best products to burn both subcutaneous and visceral fat. This means it helps you lose weight evenly. Therefore, it is good not only for burning belly fat, but for getting rid of it everywhere. Drink a cup after any meal or just when you are thirsty (cold tea is also acceptable). Grapefruit is truly unique for losing weight. It affects cells in your whole body, including ones on a belly. You can drink fresh grapefruit juice, which is as useful for fat burning as a fruit. Anyway, the belly fat will go away first, as it is mostly subcutaneous (which is easier to burn). This berry is one of the most effective products to decrease cholesterol level. It also affects your hormone production in a good way, increasing metabolism. Therefore, it provides fast and easy fat burning, including the one on the belly. This fruit is really low in calories. That is why it is always a good idea to eat apples on a diet. It is also important that they do not contain a lot of sugar, but still are sweet. Apple increases metabolism nicely and promotes belly fat burning, as it contains many fruit acids. To lose weight you need to burn some fat. All the processes going in your body affect such burning; and different hormone levels do. Since there are different hormones in man and woman bodies, some foods may not evenly affect them losing weight. For example, ginger and cinnamon provide stimulation of woman hormones, while grapefruits or apples affect man ones. However, it does not mean that these foods are not effective for one gender. The difference is only in the time of fat burning. Still, there are many variables that affect fat burning, such as genetics, weight, health etc. Therefore, gender does not make a significant difference. It is, however, a good idea to consult with a doctor or nutritionist on what products are better for you to lose weight faster. If you want to get rid of excessive pounds, you need to make a nice and healthy diet. You do not have to eat something you dislike. Anything of the mentioned is beneficial for fat burning. Just choose the products you like. In addition, doing some sport will help you lose weight much faster, as fat will be burnt to get some energy.